張京育; 國立政治大學. 國際關係研究中心 (1992). 中華民國民主化: 過程, 制度與影響. 国立政治大学国际关系研究中心. 李淑珍 (18 October 2013). 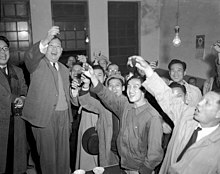 安身立命：現代華人公私領域的探索與重建 (用中文寫). 聯經出版事業公司. 第 306–頁. ISBN 978-957-08-4265-4. 喺27 March 2014搵到. Frank J. Coppa (1 January 2006). Encyclopedia of Modern Dictators: From Napoleon to the Present. Peter Lang. ISBN 978-0-8204-5010-0.